The American Film Market is now winding down but not without word of one more fascinating project making the rounds first. Australian director Mark Hartley rose to international attention thanks to his documentaries Not Quite Hollywood and Machete Maidens Unleashed. And while Hartley has been hard at work preparing a remake of classic Aussie cult film Patrick as his step into the world of narrative features he's got one more doc coming down the line first: Electric Boogaloo: The Wild, Untold Story Of Cannon Films. "Naturally, when we came to the U.S. in the beginning, the door was closed. But Menahem and me, if the door is closed, we come in through the window. And if the window is closed, we come in through the air-conditioning." YORAM GLOBUS, 1986, Cannes Film Festival. "Their names were at first a little difficult to remember, so I dubbed them the Gamma-Globulins. They were every serious film director's dream - cultivated men with money to back their hunches and the will to make quick decisions. It was the speed that impressed me most, anything they wanted to do they just got on and did it. Indeed, they turned out to be as beneficial to the health of the film business as gamma globulin is to the blood." From 1979 to 1989 Golan and Globus produced more than 120 films through their American based production entity, CANNON FILMS. They ruthlessly and enthusiastically pursued their American Dream of turning a renegade independent outfit into the seventh Hollywood major with an aggressive pre-sales policy and an insanely prolific schedule for cheap mass production, centering on exploitation fare. They became famous for producing masterworks of creative accounting - and their Hollywood misadventures were equally legendary. "Cannon shares were $1.25 when I first met Golan and Globus. I thought they'd never ever be anything. They went to $45.50 before they collapsed and the company went down the tubes. In between times Menahem and Yoram were the most wonderful firework display the industry had seen." They even journeyed down-under to produce Fred Schepisi's EVIL ANGELS - with their head of production, Rony Yacov, spending equal time with Meryl Streep and Dolph Lundgren as he jetted between productions, supervising the completion of the Azaria Chamberlain film and also Cannon's attempt to bring a popular toy line to the big screen, MASTERS OF THE UNIVERSE. Cannon Films was an enterprise that in many ways defined the cinema of the 1980s, right down to the metallic sheen of their logo, which all by itself managed to draw boos during the latter part of the Golan-Globus tenure. "They were the kings of the crap movie and the bad cheque." Over the last 30+ years, Cannon's importance and relevance both to film history and pop culture has been seriously downplayed and their ultimate demise has allowed for them to be forgotten. Cannon reached groundbreaking agreements with the Hollywood unions that made it possible for the independents to grow. They were amongst the first to utilize the home-video market and they created stars and genres that still have an impact on Hollywood to this day. 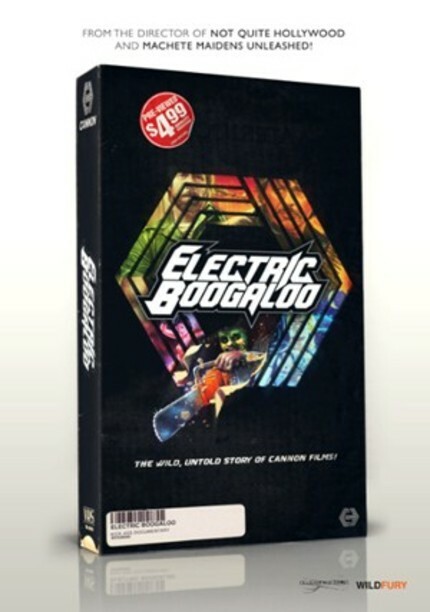 ELECTRIC BOOGALOO: THE WILD, UNTOLD STORY OF CANNON FILMS is not just a story about a unique filmmaking legacy, but of two cousins whose passion for cinema changed the way movies were made and marketed, and how ultimately this passion would come between them and the company they built together. This is a one-of-a-kind story about two-of-a-kind men who (for better or worse) changed film forever. Hartley is one of the most purely entertaining documentarians in the world today, his films jammed with information presented in the most high energy fashion possible. And his take on the world of Chuck Norris, Dolph Lundgren, Charles Bronson, etc etc etc ... well, expect good things. I can't wait! It's a great story and if Mark Hartley's directing it, it'll be a great story well told.